(A) Blood glucose and insulin levels during i.p. GTT in control (n = 12) and ZnT8KO (n = 11) mice. (B) Insulin secretion from isolated islets incubated with 2.8 or 16.7 mM glucose (n = 9 per group). (C) Pancreas perfusion. The perfusate was infused into the celiac artery and collected from the PV. 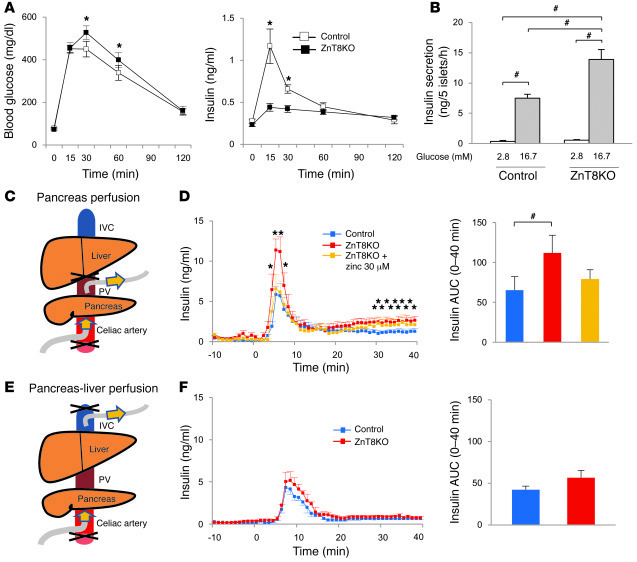 (D) Insulin secretion during pancreas perfusion in controls (n = 7), ZnT8KO mice (n = 7), and ZnT8KO mice perfused with 30 μM zinc-supplemented perfusate (n = 5). (E) Pancreas-liver perfusion. The perfusate was infused into the celiac artery and collected from the IVC. (F) Insulin levels during pancreas-liver perfusion of control and ZnT8KO mice (n = 5 per group). All data are mean ± SEM. *P < 0.05 vs. control, unpaired t test. #P < 0.05, nonrepeated ANOVA.